Tucker the turtle can't swim underwater because he has an abnormal build-up of bubbles in his body. To treat his "buoyancy problem", researchers at Seattle's Virginia Mason hospital put him in a hyperbaric chamber, making him the first nonhuman patient to receive such treatment. Last December, Tucker was found clinging to life along the coast of Oregon, far away from his natural warm-water habitat near California and Mexico. 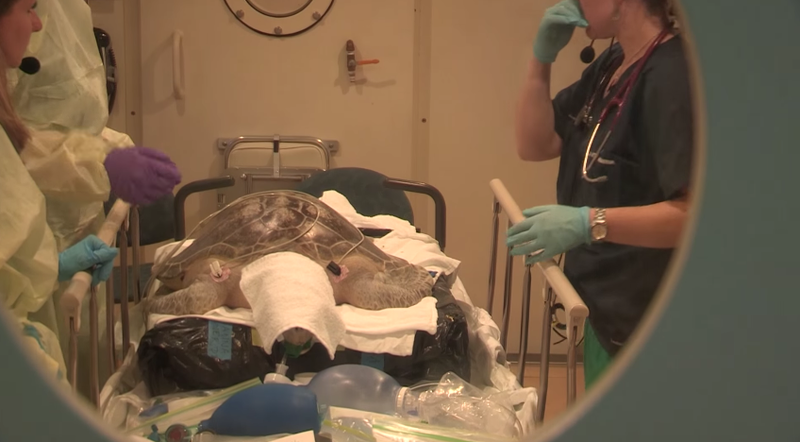 The 20-year-old endangered olive sea turtle was rescued and treated for pneumonia, among other complications. 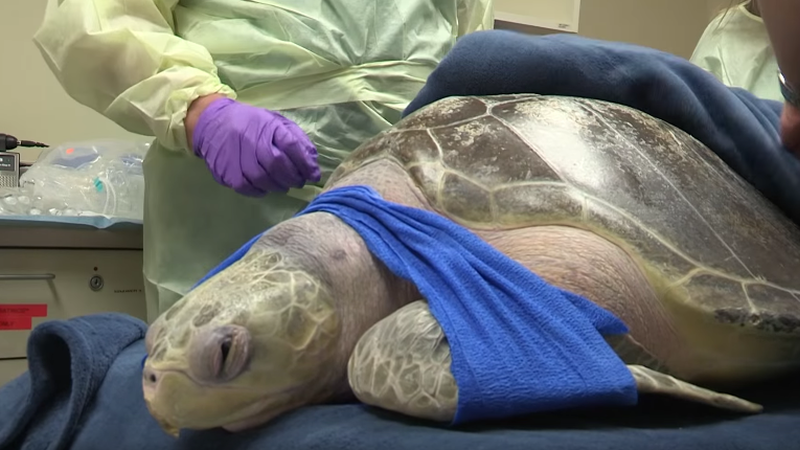 But the eventual goal of releasing him back into the ocean were put on hold after Seattle Aquarium staff learned that he suffers from a rather unfortunate condition: Tucker basically has the bends, which is causing him to float too much. This turtle's buoyancy problem, which is likely caused by an excess or enlargement of bubbles in his gastrointestinal tract, prevents him from diving or remaining underwater. The Guardian quoted a Seattle Aquarium spokesperson as saying, "It's almost like the turtle is wearing a life preserver." Sadly for Tucker, these bubbles aren't subsiding on their own. The inability to dive and swim underwater is catastrophic for sea turtles, which prevents them from finding meals and evading predators. Tucker in the chamber. 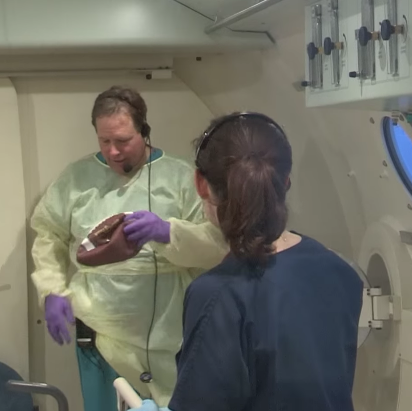 Image Seattle's Virginia Mason Hospital To make Tucker seaworthy again, a multidisciplinary team decided to put Tucker in a hyperbaric chamber at Virginia Mason's Center for Hyperbaric Medicine — a first for a non-human animal. (Virginia Mason donated its services to the cause.) Normally, these chambers are used to treat scuba divers with decompression sickness, also known as the bends. But the same principle applies; the medical staff used the same protocols on Tucker as the ones used to treat divers with "gas bubble disease". Basically, they wanted to squeeze the bubbles down to a normal size. Once in the chamber, the turtle was administered pure oxygen and exposed to about 2.8 atmospheres of pressure, which is the same amount of pressure found under 18m of water. A veterinarian ensured that he was getting enough oxygen, while his temperature and heart rate were continuously monitored. The whole thing took about two-and-a-half hours. After treatment, Tucker was returned to his aquarium. He's scheduled for a CT scan in the next few days to see if the air pockets decreased. At this point, it's not clear if he can be returned to the ocean, or when. Either way, we hope Tucker is feeling better now that all that gas is gone.